Buganda is a subnational kingdom within Uganda. The kingdom of the Ganda people, Buganda is the largest of the traditional kingdoms in present-day Uganda, comprising all of Uganda's Central Region, including the Ugandan capital Kampala. The 6 million Baganda (singular Muganda; often referred to simply by the root word and adjective, Ganda) make up the largest Ugandan ethnic group, representing approximately 16.9% of Uganda's population. Buganda has a long and extensive history. Unified in the 14th century under the first king Kato Kintu, the founder of Buganda's Kintu Dynasty, Buganda grew to become one of the largest and most powerful states in East Africa during the eighteenth and 19th centuries. During the Scramble for Africa, and following unsuccessful attempts to retain its independence against British imperialism, Buganda became the centre of the Uganda Protectorate in 1894; the name Uganda, the Swahili term for Buganda, was adopted by British officials. Under British rule, many Baganda acquired status as colonial administrators, and Buganda became a major producer of cotton and coffee. Following Uganda's independence in 1962, the kingdom was abolished by Uganda's first Prime Minister Milton Obote in 1966. Following years of disturbance under Obote and dictator Idi Amin, as well as several years of internal divisions among Uganda's ruling National Resistance Movement under Yoweri Museveni, the President of Uganda since 1986, the kingdom was officially restored in 1993. Buganda is now a kingdom monarchy with a large degree of autonomy from the Ugandan state, although tensions between the kingdom and the Ugandan government continue to be a defining feature of Ugandan politics. Since the restoration of the kingdom in 1993, the king of Buganda, known as the Kabaka, has been Muwenda Mutebi II. He is recognised as the 36th Kabaka of Buganda. The current queen, known as the Nnabagereka, is Queen Sylvia Nagginda. 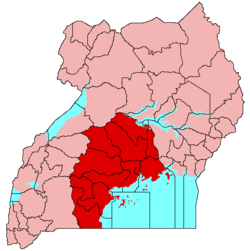 Buganda's boundaries are marked by Lake Victoria to the south, the River Nile to the east, Lake Kyoga to the north and River Kafu to the northwest. The Luganda language is widely spoken in Uganda and is the most popular second language in Uganda along with English. In literature and common discourse, Buganda is often referred to as Central Uganda. Ganda villages, sometimes as large as forty to fifty homes, were generally located on hillsides, leaving hilltops and swampy lowlands uninhabited, to be used for crops or pastures. Early Ganda villages surrounded the home of a chief or headman, which provided a common meeting ground for members of the village. The chief collected tribute from his subjects, provided tribute to the Kabaka, who was the ruler of the kingdom, distributed resources among his subjects, maintained order, and reinforced social solidarity through his decision-making skills. During the late 19th century, Ganda villages became more dispersed as the role of the chiefs diminished in response to political turmoil, population migration, and occasional popular revolts. Buganda is a constitutional monarchy. The current Head of State is the Kabaka, Muwenda Mutebi II who has reigned since the restoration of the kingdom in 1993. The Head of Government is the Katikkiro (Prime Minister) Charles Mayiga, who was appointed by the Kabaka in 2013. The Parliament of Uganda is the Lukiiko. Prior to the Buganda Agreement of 1900, Buganda was an almost absolute monarchy. Under the Kabaka, there were three types of chief: bakungu (administrative) chiefs, who were appointed directly by the Kabaka; traditional bataka chieftains; and batangole chiefs, who served as representatives of the Kabaka, charged with "maintaining internal security, supervising royal estates and military duties". The 1900 agreement, however, greatly enhanced the power of the Lukiiko (which had previously been simply an advisory council) at the expense of the Kabaka. While Buganda retained self-government, as one part of the larger Uganda Protectorate, it would henceforth be subject to formal British overrule. The Buganda Agreement of 1955 continued the transition from absolute to constitutional monarchy. During Uganda independence, the constitutional position of Buganda (and the degree to which it would be able to exercise self-government) was a major issue. Discussions as part of the Uganda Relationships Commission resulted in the Buganda Agreement of 1961 and the first Constitution of Uganda (1962), as part of which Buganda would be able to exercise a high degree of autonomy. This position was reversed during 1966–67, however, before the Kabakaship and Lukiiko were disestablished altogether in 1967 before being restored in 1993. Before the arrival of Europeans in the region, Buganda was an expanding, "embryonic empire". It built fleets of war canoes from the 1840s to take control of Lake Victoria and the surrounding regions, and subjugated several weaker peoples. These subject peoples were then exploited for cheap labor. The first Europeans to enter the Kingdom of Buganda were British explorers John Hanning Speke and Captain Sir Richard Francis Burton while searching for the headwaters of the Nile in 1862. They found a highly organized political system which was marred, however, by the ongoing practice of mass human sacrifice estimated at 800 persons annually. While in exile, Mwanga II was received into the Anglican Church, was baptized with the name of Danieri (Daniel). He spent the rest of his life in exile. He died in 1903, aged 35 years. In 1910 his remains were repatriated and buried at Kasubi. In September 2009, some members of the Banyala ethnic group led by Isabanyala Baker Kimeze announced that Bugerere had seceded from the Kingdom of Buganda. Because of the resulting tensions, the government of Uganda stopped the Kabaka of Buganda from traveling to Bugerere, leading to riots in the capital Kampala and neighboring districts. Thirty were killed in what came to be known as the Buganda riots. As of 2009, there were at least 52 recognised clans within the kingdom, with at least another four making a claim to clan status. Within this group of clans, there are four distinct sub-groups, which reflect historical waves of immigration to Buganda. The Abalasangeye dynasty came to power through the conquests of Kabaka Kato Kintu, which are estimated to have occurred sometime between 1200 and 1400 AD. The descendants of the Basimba people (also known as Bashimba) which is a Bisa and Ambo nickname of the Clan of the leopards, the bena Ngo in Zambia, who settled at Mpogo, Sironko District, are among the Ngo Clan group that come along with Kabaka Kato Kintu in his immigration. Around 1370 AD another wave of immigration assisted by Kabaka Kimera, who was the son of Omulangira Kalemeera. Kabaka Kimera was born in Kibulala, and returned to Buganda with Jjumba of the Nkima clan and other Buganda elders. The traditional Ganda economy relied on crop cultivation. In contrast with many other East African economic systems, cattle played only a minor role. Many Baganda hired laborers from outside Buganda to herd the Baganda's cattle, for those who owned livestock. Bananas were the most important staple food, providing the economic base for the region's dense population growth. This crop does not require shifting cultivation or bush fallowing to maintain soil fertility, and as a result, Ganda villages were quite permanent. Women did most of the agricultural work, while men often engaged in commerce and politics (and in precolonial times, warfare). Before the introduction of woven cloth, traditional clothing was manufactured from the bark of trees. ^ a b "Uganda: Administrative units (source: Uganda Bureau of Statistics)". GeoHive. Retrieved 18 June 2013. ^ a b "The World Factbook — Central Intelligence Agency". www.cia.gov. Retrieved 14 May 2018. ^ "Uganda Agreement, 1900". www.buganda.com. Retrieved 14 May 2018. ^ "Buganda Often called "Central Uganda"". Retrieved 14 May 2018. ^ a b "Katikkiro". www.buganda.or.ug. Retrieved 29 April 2018. ^ a b Sekindi, Fredrick Derek (27 May 2015). "A Critical Analysis of the Legal Construction of the Presidency in Post-1995 Uganda" (PDF). Brunel University. Retrieved 29 April 2018. ^ Jørgensen, Jan Jelmert (1981). Uganda: a modern history. Taylor & Francis. p. 69. ISBN 978-0-85664-643-0. ^ Reid, Richard J. (2 March 2017). A History of Modern Uganda. Cambridge University Press. pp. 158–160. ISBN 978-1-107-06720-2. ^ a b Apter, David E. (1967). The Political Kingdom in Uganda: A Study in Bureaucratic Nationalism. Routledge. pp. 276–300. ISBN 978-1-136-30757-7. ^ Jørgensen, Jan Jelmert (1981). Uganda: a modern history. Taylor & Francis. pp. 229–231, 279. ISBN 978-0-85664-643-0. ^ Sagan, Eli (1985). At the Dawn of Tyranny: The Origins of Individualism, Political Oppression, and the State. NYC, USA: Vintage Books/Random House. p. 3. ISBN 0-394-74670-8. ^ "BUGANDA7". www.royalark.net. Retrieved 14 May 2018. ^ "BUGANDA". www.royalark.net. Retrieved 14 May 2018. ^ "Barkcloth making in Uganda - intangible heritage - Culture Sector - UNESCO". www.unesco.org. Retrieved 14 May 2018. M S M Semakula Kiwanuka (1972). History of Buganda: From the Foundation of the Kingdom To 1900. Africana Press. ISBN 0841901147. OCLC 309354. Donald Anthony Low, ed. (1971). The Mind of Buganda: Documents of the Modern History of an African Kingdom. University of California Press. Donald Anthony Low (1971). Buganda in Modern History. University of California Press. Christopher Wrigley (2002). Kingship and State: The Buganda Dynasty. University of Cambridge Press.